Long string of twenty five traditional wooden block printed cloth prayer flags. The practice of hanging prayer flags goes back thousands of years to the Bon tradition which pre-dates Buddhism. It was a shamanic medicinal practice to help bring balance to the ancient elements that the colours of the flags represent. It is said that this balance can be achieved both internally, bringing health to mind and body, and externally by bringing harmony to the environment. 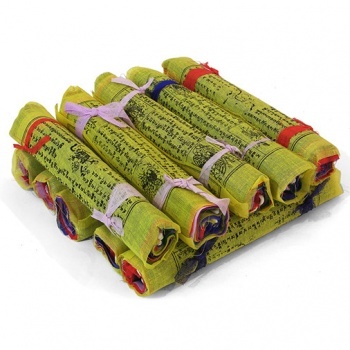 In fact the Tibetan word for prayer flags is Dar Cho, “Dar” means to increase life, fortune, health and wealth. “Cho” means all sentient beings. As Buddhism adopted some of these early traditions, the faith also began to incorporate their own auspicious symbols, prayers and mantras. Our prayer flags feature ‘Lung-ta’ the wind horse, which carries the prayers on the flags as they flutter in the wind to generate a natural positive energy. After some time the prayer flags will naturally fade and fray, symbolising the passing nature of all things, they are deliberately not hemmed. When that happens, the flags are traditionally burned to carry their blessings to the heavens and then replaced by new flags that contain our renewed wishes. Alternatively, you may simply put new ones over the old ones.